Introduction: Laparoscopic exploration of the CBD is becoming a widely accepted modality for treating CBD stones. 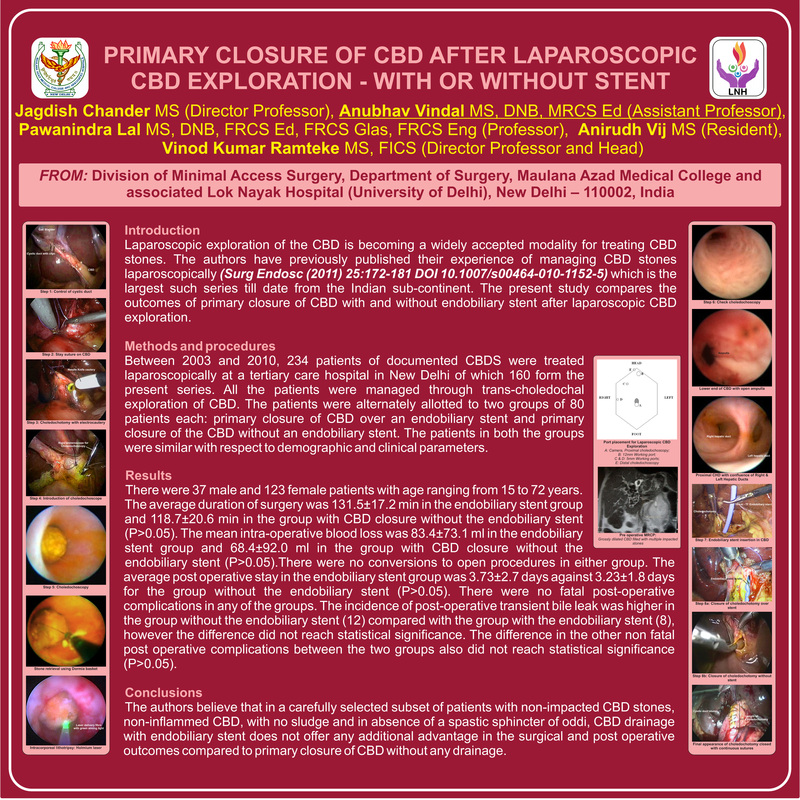 The authors have previously published their experience of managing CBD stones (CBDS) laparoscopically (Surg Endosc DOI 10.1007/s00464-010-1152-5) which is the largest such series till date from the Indian sub-continent. The present study compares the outcomes of laparoscopic CBD exploration with primary closure of CBD with and without endobiliary stent. Methods and procedures: Between 2003 and 2010, 234 patients of documented CBDS were treated laparoscopically at a tertiary care hospital in New Delhi of which 160 form the present series. All the patients were managed through trans-choledochal exploration of CBD. The patients were alternately allotted into two groups of 80 patients each: primary closure of CBD over an endobiliary stent and primary closure of the CBD without an endobiliary stent. The patients in both the groups were similar with respect to demographic and clinical parameters. Results: There were 37 male and 123 female patients with age ranging from 15 to 72 years. The average duration of surgery was 131.5±17.2 min in the endobiliary stent group and 118.7±20.6 min in the group without the endobiliary stent (P>0.05). The mean intra-operative blood loss was 83.4±73.1 ml in the endobiliary stent group and 68.4±92.0 ml in the group without the endobiliary stent (P>0.05). There were no conversions to open procedures in either group. The average post operative stay in the endobiliary stent group was 3.73±2.7 days against 3.23±1.8 days for the group without the endobiliary stent (P>0.05). There were no fatal post-operative complications in any of the groups. The incidence of post-operative transient bile leak was higher in the group without the endobiliary stent (12) compared with the group with the endobiliary stent (8), the difference did not reach statistical significance. The difference in the other non fatal post operative complications between the two groups also did not reach statistical significance (P>0.05). Conclusions: The authors believe that in a carefully selected subset of patients with non-impacted CBD stones, non-inflammed CBD, with no sludge and in absence of a spastic sphincter of oddi, CBD drainage with endobiliary stent does not offer any additional advantage in the surgical and post operative outcomes compared to primary closure of CBD without any drainage.